Prime Minister Datuk Seri Abdullah Badawi says he will not reconvene Parliament next Tuesday, as demanded by Opposition Leader Datuk Seri Anwar Ibrahim. “I do not see any reason to call an emergency sitting as we are sitting after Ramadan,” he said after today’s Umno supreme council meeting here. Earlier today, Anwar had demanded the PM reconvene Parliament next week to vote on a no-confidence motion against Abdullah’s administration. Today, the prime minister also denied that there were plans to put Anwar, or anyone else, in detention under the Internal Security Act (ISA). “If someone believes that he might be arrested, maybe he feels guilty,” he suggested. The question was raised because of Abdullah’s description of Anwar yesterday as a person who posed a threat to the country’s economy and security. “Let Mubarak say what they want, they are already retired,” he said. He said that other matters discussed at today’s meeting was were pertaining to party matters and the possible by-election in Pensiangan, Sabah. But he insisted that neither the transition plan with his deputy Datuk Seri Najib Razak nor the potential re-entry of former president Tun Dr Mahathir Mohamed was discussed. “I did not explain again on the transition plan. 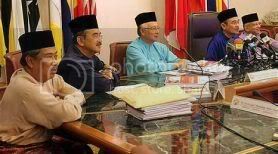 But I am keeping ears close to the ground on what is happening and I will discuss with Najib and will bring the information to the supreme council,” he said.